The tube I used is an EF800. Sonically, the mic has performed exceptionally well. The transformer is Oliver's BV8R, the capsule is a Thiersch Blue Line M7, and the tubes I've tried have all been NOS Telefunken EF800. The power supply allows me to trim voltages to ca. 5 VDC for the filament/bias supply and 105V DC for the plate/polarization supply. I'm thrilled with how it sounds. However, despite everything seeming 'right,' something is wrong-- tubes tend to fail too often. I regularly check voltages and all seems right, both within the power supply and the mic itself. I've tried replacing R1 on the schematic (grid leak resistor), and that didn't fix the problem. Several times I've carefully cleaned the tube socket and all non-conductive parts with 99.953% pure isopropyl alcohol. Some tubes last longer than others-- this past one endured for a solid month before exhibiting the telltale rustling sounds I associate with grid contamination. Others fail within 24 hours. I've tried over 10 tubes... I think somewhere between 12 and 15... and while some were unsuitable right away, others started out fine and then eventually began behaving in a manner consistent with grid contamination. Where should I look next? Could a leaky C2 cause this problem? Could the capsule be defective and leaking DC from the backplate to the diaphragm somehow? Some other problem? Any ideas? In case anyone is watching, I have a lead I'd like to follow up on/ask the good people here. Well, my C2 is polystyrene, and I did indeed clean (directly on) the cap with pure isopropyl. Could this have caused the cap to go leaky, causing my problem? 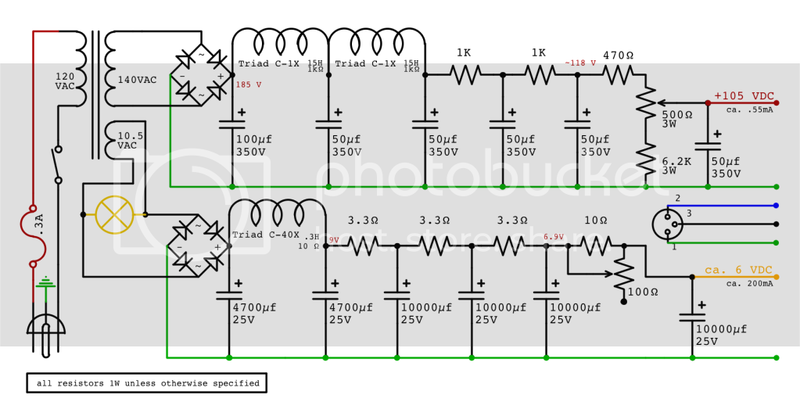 Aside of a bad batch of yubes that may have spoiled your enthusiasm, looking at the TAB schematic, and if you implemented it exactly with the values listed there, I see a couple of voltage oddities which I would check with Oliver first to confirm that they would specifically apply for an EF800, rather than an EF14. For example, I cannot believe that the EF800 penthode would be happy with such severe under-heating as 5V. instead of 6.3V. These low voltages would be ok for an EF14 but I would assume that 5V on an EF800 would cake up the cathode quickly. As to polystyrene and 99% isopropyl alcohol: Make tests on a capacitor to see what happens. I am incredulous that alcohol would harm the cap as it is well protected by a hefty layer of plastic before you would be able to dissolve material down to the first film/foil wrap. Check in with Oliver and post again! Klaus, first of all, thanks for your time. I'll try to clear up some of the questions. The tubes were widely sourced. I had between 12 and 15 fail so far, the majority from very strong batches known to produce many good tubes--All NOS Telefunken. This is why I feel something is wrong with my microphone. Five were from a reputable person whom I trust (and whom you know personally-- can reveal who in a PM if you want) with a known-good stock who had some good success using this particular batch in microphones-- better than 70% success rate, he said. Two were from a well-known retailer, quality of stock unknown. Still others were from Ebay, from an old bulk stock of unknown quantity. Finally, three were packaged-for-retail versions from two different eras (different box designs; two of the common red/blue design, and one an older white/olive scheme), all still in the old shrinkwrap, untouched since packaged for retail. These three lasted longest. Failure mode is always frying/rustling sounds. I have experimented a bit with the heater voltage. Like you, I suspected that the underheating may be causing the problems, so I cranked the heater voltage up to 6V. Oddly, in this case, a higher heater voltage seemed to kill tubes even faster. Then, on the advice of a local friend quite knowledgeable in vacuum tube construction and application (owner of Leeds Radio), I tried the opposite direction-- underheating down to about 5v, or even a touch below. When underheated in this way, I got a few tubes to last several weeks to a month, but just when I would start to feel really good about it and think I had the problem solved, the rustling/frying sounds would come back. I have been in touch with Oliver about this mic and he's been helpful-- it was he who suggested I try replacing R1 (which did not solve the problem, though I thought it had). I apprised he and Joe of all voltages I'm measuring inside the mic and the power supply, and neither has voiced any concerns about the ~5v heater supply. I do believe they're quite busy over there right now, so if I can ever get a minute to chat with them again about it, I'll certainly ask about that again. Thanks so much for giving your advice. If anything else comes to mind, I'm certainly listening. I have read your tube selection FAQ several times, and it's great info that I live by-- it's just that this time, I feel like something else must be wrong. P.S. : I also cannot share your initial suspicion that there may be possibly something wrong with the value of the grid-to-ground resistor. A value of 100MΩ to 1Gig Ω is quite common in this particular circuit application. How about this: take one of these tubes from the batch that has already produced several duds and install it in another mic, to verify its quality. Unfortunately, I don't have another mic that uses the EF800. Today I replaced C2, found/cleaned a bit of flux residue on some other components that I had missed, touched up some solder joints, put in a fresh EF800, trimmed voltages, and put it back together. It's up and running now, but for how long? With the fresh tube, I measured plate voltage and cathode voltage with respect to ground, and made a note of those. If the tube starts to fail again, I can at least compare measurements and see what changed. I also nudged the heater voltage up a few tenths of a volt. It's still underheated, but not quite as dramatically. With an EF800, what cathode voltage do you measure on average in that circuit? Should be somewhere between 1.2 and 1.8 VDC. What is Oliver's opinion on this? He is the designer of the kit, and has been using EF900 extensively in his mics. His opinion was that I should try changing the grid leak resistor, which I did. I haven't been able to get in touch with him to inform him of the newest developments. I believe they're quite busy over there. I'll try calling or e-mailing again next week, but I don't want to become a pest. They've already helped me out a lot. R1 and C2 have been changed. Several NOS Telefunken tubes have been tried. The mic has been carefully cleaned of all fingerprints and flux residue with 99.953% pure isopropyl, except for the new polystyrene C2, which I was advised not to clean in such a manner. All solder joints in the top portion of the mic (between capsule and tube) have been inspected and, if necessary, reflowed. Tube pins were carefully cleaned. Not sure what my next steps are. Tomorrow I'll be back at the studio and I'll be able to get some measurements of the tube in its current (malfunctioning) state to compare with the (working) measurements I took yesterday. Perhaps this will give me some clues. Hopefully I can speak with Oliver or Joe again soon, too. The problem for me is that this circuit is somewhat unusual in its layout and its values used. I would probably have started out by using a n EF86 with a 6.3 V heater, a cathode bypass resistor which would dial in about 1.6 to 1.8 volts, and a plate resistor/voltage divider that gets me around 75V plate voltage. I would even try that set up with an fresh and proven healthy EF800. I am not familiar with a situation where any of the components you are using could deteriorate and destroy the tube, as you have been experiencing. It would help an awful lot if you had a friend who also is using this unusual tube in a condenser mic. A friend of mine, Scott Hampton (scott@hamptone.com) experiments with DIY condenser mics and is quite knowledgeable. You may want him to read this thread. I'm following this thread with interest, as I'm basically done with one of the AMI 47 kits that I built with the intention of using an EF800. I'm now just waiting for a PSU that I ordered from AMI to fire it up, so we'll see how it goes; but I'm also wondering if I'm in store for problems with tube reliability as well. I had already picked up a number of EF800s because I have a Wunder CM7-gt that also uses that tube. I haven't opened that Wunder up to investigate yet, but I'm curious to see how similar / dissimilar it is to Oliver's circuit. Thanks, Ryan, for chiming in! Yes, I'd be very interested to hear a few things about the CM7GT if you're the curious type-- namely, plate voltage, heater voltage, and bias voltage. If there's any chance for you to check those things at some point, I'd be eternally grateful!! P.S., I was told that my microphone malfunctioned again today, in very short order. Are you sure it's the tube, not the capsule? Can you replace the capsule by a little capacitor and still hear the noise, using one of those "broken" tubes? BTW: you can "refresh" a tube by overheating it for a short time. You don't have something to loose in this case, you can just try how much and how long you need to. I have advised for cleaning the high impdance path in another tread here - I still vote for that when building a mic (partly from dirty, vintage parts like old tube sockets), but doing it over and over isn't necessary. - The grid resistor I would use 60M instead of 1G for a more stable bias. - The heating arrangement: I would feed 6.3V into the other side of the heater (now on 0V) bypass R2 and let R3 determin the amount of underheating (Voltage on R3=1,2V). It would make a clearly defined 0V rail instead of two. These mods would come closer to the proven (with another tube of course) U47 circuit. I received some helpful e-mails from Scott, whom Klaus suggested I contact. He brought up a good point, which made me realize I don't have a soft start or delayed warm-up for either my heater or high voltage supplies. Could the 'sudden on' nature of my power supply be causing the tube(s) to prematurely fail? Would anyone have any advice for creating a soft-start circuit in my supply? NTC thermistor perhaps, or is it not that simple? I will try subbing a small cap in place of the capsule. However, I've had some tubes that have 'behaved' for weeks before failing, so it leads me to believe the capsule is OK. Replacing with a fresh tube always solves the problem, for a short time-- sometimes 'relatively' short and sometimes 'very' short. Your ideas about further mods are noted. However, I'd like to get the mic working in this arrangement first, since it sounds very good. In conversations with Oliver, Joe, etc. it seems that I should be able to get it working with the schematic above. My grid leak and polarization resistors right now are 200M, not 1G as listed on the schematic. ..I don't have a soft start or delayed warm-up for either my heater or high voltage supplies..
No vintage device ever had a soft start. Tube life isn't much affected by power cycling. Changing the tube mostly cured my mic's if the capsule was failing, for a short time, like you experience it. I don't know why, might be that the noisy stray current needs to take some time to build up after power cycling. Try the 50-100pF capacitor as capsule dummy just to be sure. Use an old, known "bad" tube for the 1st test, maybe it's no longer bad then! 2nd: if it's posible to "refresh" the tube like described above, it would be a strong evidence that underheating isn't suitable with the EF800. One more idea: have you checked for high voltage peaks from the PSU - those can break a tube. They could be generated by switching off the PSU or from an outside source (machines, fridges, air conditions etc.). You can use ceramic C's at the PSU out to block those to gound. Ah! Now this is all helpful info. Thanks. I will certainly try the cap thing. I assume something in the neighborhood of 60-100pF would be ideal? I have tried 'refreshing' the tube by overheating for a period. Mostly I've had no luck with this, although with the first one that failed, that did seem to work, for a time. After that, though, I haven't been able to refresh any of them in this manner. The high voltage peaks are definitely something I'll want to eliminate. While the power in the studio (where it has been failing) is mostly clean as far as I know, and on a dedicated supply that we had run when we did the buildout (the studio even has its own true earth ground) that wouldn't help with turn-off surges you allude to. If it's just a matter of a few ceramic caps to ground I will definitely do that. Please forgive me for the following simplistic question-- I have no formal electronics training and am just a hobbyist. If I attach my power supply schematic, could you instruct me where I would install these ceramic caps? Did you try to replace the tube socket? This points to, that underheating is not the problem, as you would have successfully refreshed at least 50% of the tubes then - if you had overheated them strong enough (there's information on the internet how to do it). It seems more likely something bad happens to the tube grids. could you instruct me where I would install these ceramic caps? The caps would go in parallel to the 50uF/350V and 10000uF/25V cap next to the 105V / 6V output. Use 1nF/500V and 1nF/100V ceramic. Seeing your PSU architecture (classic LC/RC filtering) it's not too likely that high voltage spikes come through, but I still consider the little effort worth trying. Another source of high voltage spikes is static electricity from carpets on the studio floor (specially if they are quite new). You would notice the discharge sparks when touching something grounded. Usually those wold not enter inside the mic, but who knows? - Did you keep cable shield and 0V wires separate? This means cable shield goes from PSU housing and XLR1 to mic housing only, and PSU 0V's go to tube circuitry only. - Is your studio supply line voltage properly grounded to earth? Use 1nF/500V and 1nF/100V ceramic. Seeing your PSU architecture (classic LC/RC filtering) it's not too likely that high voltage spikes come through, but I still consider the little effort worth trying. Absolutely will do, thanks so much. Another source of high voltage spikes is static electricity from carpets on the studio floor (specially if they are quite new). You would notice the discharge sparks when touching something grounded. Usually those wold not enter inside the mic, but who knows? Our studio's floor is a 4 foot thick concrete slab that's original to the ~125 year-old original outer structure (an old Brooklyn factory) that we did our buildout in. We have a few area rugs but no carpet, and have not noticed any static electricity. I feel like we can look elsewhere for now. - Did you keep cable shield and 0V wires separate?cThis means cable shield goes from PSU housing and XLR1 to mic housing only, and PSU 0V's go to tube circuitry only. Ah! No, I don't think I did this. I will have to open my cable and double-check. I do notice occasionally that we have to use a ground lift adapter on the mic's power supply, and wondered why. This must be the reason why. I will definitely check this, and remedy it ASAP. Could this be causing the mass slaughter of tubes? According to our electrician, who did the install when we did the buildout several months ago, yes it is. Thank you so much for helping me work through this and giving me things to check. I really appreciate it greatly. Same for everyone here. I advise against this. Most microphone systems do not do this separation of grounds. aside of the fact that ground separation cannot cause discharges in tubes or destroy them, it just invites more problems than it solves (noise, hum, RF...) I always connect all grounds centrally in tube mic systems. This guarantees lowest noise floors without any ill effect. Please also read the sticky about why it is impossible to generate a ground loop at the beginning of the recording chain (microphones). I always connect all grounds centrally in tube mic systems. Where is your ground center - mic or PSU? ...Please also read the sticky about why it is impossible to generate a ground loop at the beginning of the recording chain (microphones). A tube mic with external PSU is no single ended device, as the PSU is grounded for safety. So it depends how how the mic pre handles ground. The proper way would be XLR pin 1 goes to case and nowhere else. This is not the fact in most designs, partly because P48 is referenced to GND, and as it's a bit harder to achieve proper RF shielding. I have to ground-lift commercial tube mics quite often to remove hum (sometimes on the expense of RF stray effects), so I would say with a tube mic it's well possible to build a ground loop via safety earth. I prefer to connect audio / supply ground to case/safety earth via a 10nf capacitor in parallel with a 10 Ohm resistor in the PSU. This reduces ground loops to almost zero, gives good RF shielding and a defined potential for the PSU/Audio 0V. The problem is, that there is no logical reason at all why the tubes break. So removing all possible or visible problems might hopefully catch the killer. The 0V rails of both PSU 6V (pin 5) and 105V (pin 4) are not connected except via the R2/R3 voltage divider in the mic. This could mean any potential differences caused by the PSU mains transformer's stray effects will discharge across those, causing adverse effects. I don't even see how the circuit can work correctly without that bridge, as R2/R3 don't even see the 5,05V they are made to work with. Maybe the bridge already exists (check pin 4/5 on both mic and PSU with an Ohm-meter, without anything plugged in). If not linked you could try a bridge inside the PSU. This would keep the GND current flow in the cable untouched, while unifying the PSU GND potential. Thanks, Kai and Klaus. I'll check on all this. It might be next week before I get to it. Aside from killing tubes the mic has been performing well, and is quiet, so I suspect I (inadvertently?) put something in place to unify the ground potential that may not be reflected on the schematic. I'll have to go back and see what I did. I do recall "where do the grounds come together?" being a question I had some confusion with when building the PSU and making my 7 pin cable. Where is your ground center - mic or PSU? A tube mic with external PSU is no single ended device, as the PSU is grounded for safety. Theoretically you are right. but in practice, I am sorry to disagree: Rarely will you find a safety ground connection (middle pin of the AC connector) on tube mic powere supplies. But even in cases where the AC-safety ground is connected (some modern replacement p.s.) , I have in 25 years of experience never found a single case where an AC ground in a p.s. caused a ground loop. The proper way would be XLR pin 1 goes to case and nowhere else. To connect the XLR cable ground would be an invitation for RF disaster. Neumann and Gotham (cable maker) suggest to never separate grounds and shields in mic cables, phantom of tube, or to disconnect them from pin 1 or any other ground/shield termination points on connectors. As a matter of fact, Neumann (and I) recommend to connect ground, shield and connector housing to Pin 1 on BOTH ends of an XLR mic cable. Aside of the (theoretical) AC chassis ground issue there is no chance for a ground loop to occur in microphones: the mic, being the beginning of the chain, has no electrical or physical contact with any component; hence no possibility for a ground loop. So the usual ground-loop rules of interconnects between audio components that are individually powered differ here. Neumann did the 10 Ohm resistor solution internally in KM84 mics, but only there, and God knows why in no other model. I totally agree. However, chassis ground routing is not part of the solution for the prevention of failing tubes in his case. You hinted in your response to something else which needs to be tested by the poster: installing the seemingly defective tubes in another mic, and see whether they work there, or whether they had been permanently damaged. I finally got around to working on this mic some more. I added the capacitors Kai suggested-- I figured that, while unlikely to solve the problem, it couldn't hurt. While inspecting everything, I found one very interesting/promising lead-- I had an intermittent ground connection on my plate supply. Experimentally, when prototyping my power supply I found that having separate star grounds for 5.1v and 105v supplies seemed to be the quietest arrangement. The star ground for the 105v supply was connected to chassis at the multipin Binder connector, using a solder lug under the nut that bolts the connector to the chassis. That screw had worked itself a bit loose (likely was not tightened properly after some experimentation with the ground scheme). In hindsight, the issues with tube failure would often happen after moving the mic for some purpose (though I never made that correlation before now). Basically, I feel like I was losing ground reference on my B+ supply intermittently. I'm hopeful that this intermittent ground connection is what was causing the problems with tube failure. It's been corrected now. I have replaced the tube once more, and currently have the mic burning in with a 68pF capacitor in place of the capsule. While I feel somewhat optimistic that I might have found my problem with the loose ground, I still feel it's probably a good idea to rule out the capsule once-and-for-all. A word on how I ran my grounds, and feel free to comment. After much experimentation, this seemed to be the quietest arrangement for me. All 5.1v supply filter capacitors and bridge rectifier grounds, and any other ground in the 5.1v supply, connect together and to chassis at the first filter cap of the 5.1V supply (and connect nowhere else). All 105v supply grounds (similar to above) connect together, and their star ground point is right at the multipin connector. XLR pin 1 connects to the 105v supply ground. 5.1v and 105v supply grounds connect only through the chassis itself, where they're quite some distance apart, physically. The 3rd prong safety ground connects to the chassis right at the IEC connector, physically very far from both star ground points. I arrived at this configuration through much experimentation (I tried lots of others, including a single star ground for 5.1v and 105v supplies), and it really did seem to be the quietest. I'd always be open to suggestions from experts such as yourselves, if you see anything wrong with my scheme. Thanks for your help so far, and fingers crossed that I've found and corrected the problem. If the ground sceme works best, leave it as it is. I've seen all types of grounding scemes when looking on audio devices. There is no universal rule how to do it, as ground/earth/shield/safety ground serve different purposes with different, often contrary needs. In theory, on a transformer balanced interconnection e.g., you wouldn't need ground at all. Practically this doesn't work with mic's, as the levels are quite low, and even a transformer balance is far from perfect. The only thing I've learned so far: avoid screwed contacting with GND connections, always use soldered joints. Resistance is too high and undefined with screw contacts, even if you use toothed washers. E.g. the housing contact of an XLR connector is catrastrophicly bad on connecting GND to case. Keep us informed if your fix works, we all had agreed that we could not see an obvious reason for your problem. I sent my mic off to have someone look at it. When I hear what the diagnosis is, I'll let you know.